Our happy bird-day and other bird-themed greeting cards were pretty popular at Migratory Bird Festival 2015. Now you can download them for free and make your own! 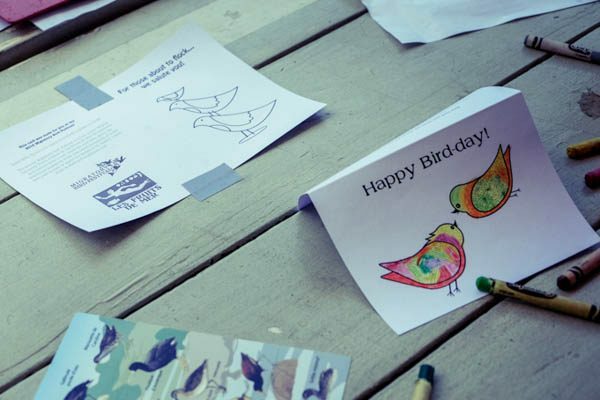 Color and create with these bird-themed cards, created for Migratory Bird Festival 2015. A great activity for people of all ages, everyone can leave with cards to give to friends or family. Their available below and on our Art Activities resources page, where we also have other fun activities. Download for free: English, 10 designs A4 paper – English, 10 designs, Letter paper – French, 4 designs, A4 paper – French, 4 designs, Letter paper. Print on A4 or Letter card stock. Cut sheets in half using a paper cutter. Color and fold the cards. It is great to provide examples, particularly for the cards with space for drawing your own design.